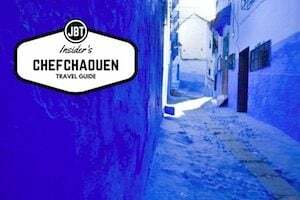 The obvious question when you first get to Chefchaouen is: “Why is it blue?” Many reasons are offered and most are myths. Some of the myths include: the color repels mosquitos; it reminded the original (non-existent) ex-sailor residents of their seafairing past; it’s a reminder to remember heaven. The real reason the entire city is painted blue is really simple. When Jews were expelled from Spain at the end of the 15th century, many came to Chefchaouen. They painted the Mellah, the Jewish area in light blue. 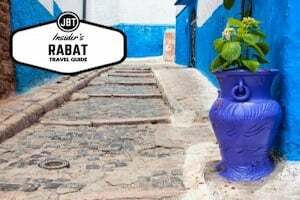 According to Fatima Habte – responsible for my guided tour of Chefchaouen and the owner of the excellent Gite Talassemtane, a local tour and trekking company – they even added a touch of blue dye to their white sheets. Over centuries the blue decor spread, transforming the medina from its original white walls and red tiles roofs. Recently, people have become bolder with the shades of blue used, adding tones of turquoise, violet and purple. When I asked Fatima what she most wanted people to know about Chefchaouen, she said, “It’s more than blue. We have a rich culture and history and we are surrounded by beautiful nature and national parks.” She should know, she grew up in Chefchaouen’s medina. On my guided tour of Chefchaouen with Fatima, I learned a lot about this incredible city that added cultural and historical depth. 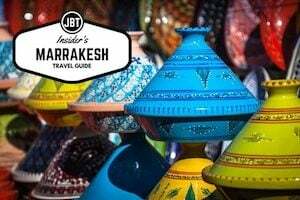 History buffs might like to know that Chefchaouen was founded in 1471 by Moulay Ali ibn Rashid al-Alami, as a place from which to fight the Portuguese, who had been invading Northern Morocco. The kasbah in the main square was al-Alami’s fortress home and is worth the 10Dh admission fee (about a dollar) if you have 30 minutes to spare. You can visit the dungeon, climb the tower to take in a great view and stroll the beautiful grounds. In one corner of the kasbah’s courtyard is a partially excavated tunnel, the origin of which is unknown – some say it’s part of a series of escape tunnels built by Abd al-Krim el-Khattabi, who led an early 20th-century revolt against Spanish colonialism while others say it was a prison, part of the original Kasbah. Fatima believes it was built by the Romans, long before the kasbah. Until funding is found to do the research, no one can say for sure. The main square, where the Kasbah and Great Mosque are located, is called Ouda el-Hammam (place of the hammam), named for the first hammam in Chefchaouen, which has been running for centuries. With the kasbah on your left, take a right after you walk past the cafes and you’ll find the wood-fired hammam on your right. At the opposite end of the main square with the cafes on your left, take a left and look for Hotel Al-Kassaba. Across the street from that, you’ll see an arch with a shop built into it. This is Chefchaouen’s old fondouk, or caravanserai. As is the case with the structures, it’s now the domain of craftsmen working in its old lodging rooms. At the far end is a blacksmith who will be happy to show you how he works using traditional methods. 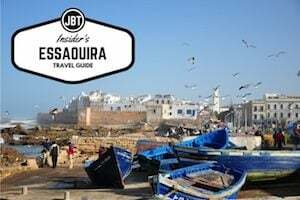 Now turn around and find your way behind the kasbah and mosque to a smaller square called Sidi ben Lahsen. A few decades ago, women spun and sold wool here. Opposite the back of the mosque is a public oven, built during the original founding of Chefchaouen and also still running. At the end of the square is an arch which is the entrance to the mellah, the old Jewish section. The area just beyond the arch is called Al Khrazzin, the Leather Place. This is where many craftsmen worked. Though it’s mostly for tourists now, there still a few highly-skilled leather workers still there. No visit to Chefchaouen is complete without spending a little time along its gorgeous river. A short walk uphill from the bridge, see the source of the river, a waterfall tumbling down the mountain called Ras el Maa. Under the bridge and continuing downstream, women do laundry. In fact, this whole section along the river is called Sed Banin, the Laundry Place. According to Fatima, utilities tend to be shared among multiple residents in a home and rather than argue over costs, some choose to use free water from the river. All along the far side of the river are canals which carry water that used to power mills. You can even see an old mill stone built into the retaining wall part-way down. Most of the mill houses are now cafes and limit their grinding to coffee. Only one mill is still intact, but it’s closed and unused. A couple of final notes: First, be sure to look for the plaques in Spanish and English that explain the historical significance of many sites in Chefchaouen. Second, here even more than in the rest of Morocco, people hate having their picture taken. Follow the normal courtesy and ask first, but don’t be surprised if the answer is nearly always “no.” Still… remember to pack your camera because The Blue City is impossibly photogenic… and that is no myth. That’s a fact! 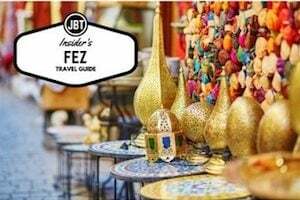 For your own guided tour of Chefchaouen, contact Fatima Habte of Gite Talassemtane here: http://gitetalassemtane.com/en/contact/ or contact Journey Beyond Travel to arrange a longer excursion to The Blue City and the rest of Morocco. Mike Bernhardt left a career in IT at the end of 2016 and now pursues two of his passions at the same time – traveling and writing. He gets to do it with his third passion, his wife Yvonne! You can read more about Mike and his travels around the world here: travelingwithmikeandyvonne.com.